Interests - Roblox, Minecraft, Planets/Space, Gadgets: laptop, X Box, iPad, Dr Who, Marvel Superheros. 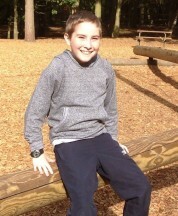 Joseph was diagnosed with Cystic Fibrosis at 4 days old through an emergency blood test taken when he was a day old. 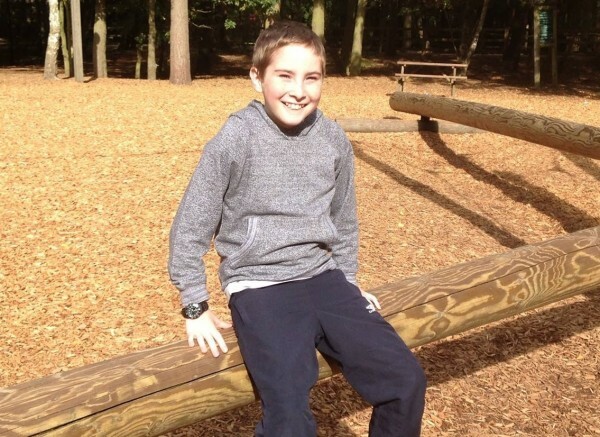 This emergency was brought about because his then 8 year old brother had also been diagnosed at the age of 4 with the genetically inherited life-threatening illness Cystic Fibrosis. Once a positive diagnosis was made they were able to start treating him immediately with the crucial medication needed for an important start in life. Joseph is a happy, outgoing, funny, naughty and extremely cute “normal” looking 4 year old. What is going on inside his body is unknown to many – no one would ever think he had a life-threatening illness. Joseph’s health has deteriorated considerably over the past few years. He now has CF related diabetes, CF related liver disease, nasal polyps, severe Bronchiectasis and is fed overnight via a Mic-Key button after a Gastrostomy in February. His lung function has dropped by over 30% in the past year. He has frequent chest infections and IV antibiotics for 2/3 weeks every 2/3 months. Joe is currently unwell and due to start IV antibiotics ahead of a Fundoplication procedure to stop the reflux which is causing him to cough constantly. Many thanks for the cards and presents this month – especially the lovely chocolate cake. February was not a good month for Joe. He started it having 2 weeks of IV antibiotics. After this 2 weeks his lung function was no better so he was admitted to Hospital for a 3rd week of IV antibiotics and to work with the Physio. While he was admitted he has an Endoscopy and a PH Study under general anaesthetic to find out when his lung function has dropped by over 40% in a year since his Gastrostomy in January 2015. As a result of this it was discovered that he is silently refluxing which means he will be admitted to Hospital again soon to undergo a Fundoplication procedure to stop the reflux. Joe’s health is not great at the moment. HIs lung function was down to 49% from 55% before Christmas last week. He started a 2 week course of IV antibiotics on 1st February and was really unwell. SAT’s low, struggling to breathe properly and he escaped being admitted to Hospital only by me insisting they allow him home. He gets more sleep/food/Physio here with me. Today his blows are up to 51% and SAT’s 99%, so progress is being made, albeit slowly. With thanks to every single person who takes the time to write to Joe, send him a card or a gift – really appreciated. Joe had a lovely Christmas and received lots of cards and several gifts. Many thanks to everyone who took the time to send a card, write him a letter or send him some lovely gifts. Sadly Joseph has returned to Post Pals as his health has deteriorated considerably, his lung function has dropped by over 30% in the past year. He now has CF related diabetes, CF related liver disease, nasal polyps, severe Bronchiectasis and is fed overnight via a Mic-Key button after a Gastrostomy in February. He has frequent chest infections and IV antibiotics for 2/3 weeks every 2/3 months. I feel it is now time to move Joe on from Post Pals to make room for those more in need. I would like to thank all those who have taken the time to send Joe post over the past few years. Thank you for all the support. Joe is currently struggling with a persistent cough which has been lingering for a few months, so IV’s are on the horizon sooner rather than later – much to his disgust as he is still not keen on needles. His weight gain is still a problem and on-going struggle. Joe now has Dan’s Xbox so he’s become slightly addicted since Christmas! He loves playing on the Toy Story game and Ben 10 game. Thank you to all who took the time to send Joe a Christmas card or gift – he loves receiving post, especially cards. The on-going problems with Joe’s weight gain remain and we’re fighting to keep him well for our holiday in Cyprus next week… he can’t wait! Hopefully this will make a big difference to his weight as he loves the pancakes for breakfast there. It’s a pity we can’t move out there to live in winter! Joe is still struggling to gain any weight and this is now becoming a bit cause for concern. We’ve tried build up drinks of varying kinds, but he is a picky eater and eats very little. He is being threatened with tube feeding if he doesn’t gain a reasonable amount of weight over the next few months. He is also under threat of another 2 weeks of IV’s before Christmas if his persistent cough does not clear up with oral antibiotics. He has just had his annual flu jab which made him quite ill for about 24 hours, but is now back to his usually happy, smiley, hyperactive self! Joe is relatively well at the moment – touch wood. His brother is in Hospital so Joe has acquired his X Box for the duration of his stay! Joe had 10 days in hospital this month for emergency IV’s before we departed for Cornwall for 12 days. His breathing problems appear to have disappeared and at the moment he is relatively well and looking forward to going back to school next week. Thank you so much to Post Pals for providing Joe with tickets to Legoland – he is really looking forward to going. Joe is currently in hospital. He was admitted on Friday for emergency IV’s due to breathing difficulties and crackly chest. We are hoping that a week of IV’s will suffice to pick him back up so we can go on our summer holidays to Cornwall on Saturday. It’s all looking a lot better after only 4 days, so fingers crossed. Thank you to Post Pals for organizing the personalized pillow case – Joe loves his. Joe is relatively well at the moment. We’re waiting for an appointment for a scan on his nose though as it appears that he has nasal polyps – another nasty addition courtesy of Cystic Fibrosis which has caused his nose to be constantly blocked for about 18 months – new Steroid spray is clearing it a little and he is amazed that he can now breath through his nose… something which we all take for granted! Thank you to the lovely lady who sent Joe a quilted cushion with frogs on it – he loves it! Joe has his Annual Review on Tuesday with his brother. He is not looking forward to that as he is terrified of needles, but he always gets something as a “prize” after for being brave. He is having lots of problems with poor weight gain, constant cold, hearing problems, and breathlessness. He has been diagnosed with having Hayfever, so that’s causing him problems and has now been referred to the ENT Department to ascertain if he does indeed have a hearing impairment or if it’s just selective hearing for a child his age! At the moment my smiley happy Joe is not so smiley, but post does help so please keep it coming – he likes the fact that he gets more post than us! Thank you so much to all those who took the time to send Joe a birthday card – he got loads! Thank you for the lovely letters Joe has received this month – especially from the children – he loves to read them all. Thank you for all Joe’s birthday presents – they made a difference to his day. Post for Joe as a distraction at the moment is vital as his Annual Review is looming within the next 4 weeks and he is terrified of needles, so he is not looking forward to his bloods being taken and is constantly whittling on about it. His chest is not good at the moment, having grown Pseudomonas yet again, so he is on oral antibiotics and under the threat of 2 weeks of IV’s if this course does not work – another fear factory of 2 weeks of canula needles. He is also struggling to gain any weight, which is a major issue and a constant battle. I’m so pleased that Post Pals got a mention on the BBC program – it has given the charity a major boost in awareness for all the children who deserve smiles. Thank you for all the lovely cards and letters Joe has received this month – especially from the School children who have taken their time to write some very interesting letters. Joe has also received some lovely presents this month – he has been very spoilt! He wants to know why he is so special getting so much post! Thank you to all who sent him something to make him smile. Joe is struggling in a big way to gain any weight, so I fear he may be taken in to hospital soon for drip feeding and IV antibiotics. He has been growing a concoction of Pseudomonas and Staphs for a few months and has not been admitted since last April, so much to his disgust, the inevitable may happen very soon. He is very excited about the new Dr Who starting on Saturday and is currently counting down the days and hours until it starts! Joe loves all the hand made cards he has been sent this month, so thank you to every one who took the time to send him one. He’s been saving them. Thank you to all who took the time to send Joe a gift too. Joe is continually fighting a cold virus which he has had for well over a year, but it doesn’t get him down. He continues to be a happy and outgoing little boy. Joe has a Nintendo DSi now so is learning how to play games on there – it’s excellent for teaching him how to spell and add up. Joe’s Gerbil, Rosie, has had more babies so now we have 14 Gerbils and counting! We’ve had to separate male and females to stop the breeding. Thank you to Catherine and Anne for the lovely box of treats for me for Mothers Day – a pleasant surprise and most welcome. Thank you to all those who took the time to send Joe a letter or a card this month – he has had lots of letters and loves to read them all himself now. Thank you to all those who took the time to send Joe a gift this month as well – especially his Valentines gift. Joe continues to try and fight the germs which threaten to hospitalise him for another 2 weeks of IV’s – something he does not relish. His brother is to be admitted for 2 weeks on Friday so he is worried it will be him next. That’s not always the case with CF though – we just go with the advice we are given. Thank you for all your help and support – we appreciate the Smiles that Post Pals give Joe when he is feeling sad. Special thanks this month to Joe’s special smile poster! Joe still has a cold which appears to have lasted all year, but so far it’s not making him ill. He is struggling to gain a significant amount of weight and I do worry a lot about him. Both boys have CF Clinic appointment tomorrow so I need to get some advice on build up drinks or more high calories diets. If anyone has any advice on how to get a 6 year old to eat more/tempt him with things to eat, I would appreciate any feedback. Joe’s Gerbil, Rosie, had another litter of babies just before Christmas! She has had 9 since August… Gizmo has been busy! Many thanks to all those who sent Joe a Christmas card this year – he stuck them all up in his ‘Den’. Thank you to all those who wrote Joe Christmas letters – so much effort went into them and Joe loved the stories. Many thank you’s to Joe’s Elves who sent him some lovely presents. He was so excited every time he received a parcel/package and put them all under the tree ready to open on Christmas Day. Joe is still struggling with a cold which has lasted for months and is getting him down. He’s been put on yet another antibiotic to try and shift the wet cough which is developing, so that he can enjoy his holiday in Cyprus in 10 days. We hope it will help. Joe’s gerbil, Rosie, gave birth to 5 babies 2 weeks ago and so he is very excited about that and loves watching them growing. Thank you to all those who took the time to send Joe a card or gift this month. Joe is keeping relatively well. He is still fighting a cold virus which is into its third week and is making him feel a bit grumpy. He has lost 2 teeth within 2 weeks so is a bit gappy on the smile front at the moment! He was very excited to get money from the Tooth Fairy, although his older brother did spoil it by telling him she didn’t exist! Joe and his brother have a Gerbil each now – Gizmo and Rosie (Rosie is Joe’s) so he’s been very keen to learn about them. He is a big animal lover and now wants a pony! I’d like to thank all those who took the time to send a card or a present to Joe while he was in hospital and also everyone who sent Joe a card/present for his birthday. He still loves to receive post and is now starting to learn more about what Post Pals actually is and what it does for children like him who have to spend time in hospital. I’d like to thank those who took the time to send Joe some post and lovely presents while he’s been in hospital for 2 weeks undergoing IV treatment – they did make a difference and definitely made him SMILE!! Post can now be sent to the usual c/o address though. Joe is due to be discharged on Tuesday afternoon – the day of his and his brothers Annual Reviews! We are all ready for a holiday now. Joe is currently keeping relatively well although still struggling to shift a reoccurring cold and having problems gaining weight. He is still very active though. Thank you to those who sent Joe a present this month. He especially loved the brown bear and he now sleeps with it. He loves cuddly toy bears of any kind and badgers too – he has a special friend Badger he calls “Sniffy” and he writes stories about him. Joe is still teetering on the edge of having a 2 week hospital stay on IV’s. His older brother is currently in hospital for 2 weeks of IV’s and they would have had Joe as well if they hadn’t been so busy. He is on an antibiotic again for 4 weeks – if that doesn’t shift the horrible cough he has got, he’s to be admitted. He is not looking forward to that – he is terrified of needles. We also discovered on Monday that he might have Glue Ear and Nasal Polyps – both common in children with Cystic Fibrosis. We’re waiting for a referral to an Ear, Nose and Throat Specialist. Joe is currently keeping well after a stint of colds and coughs before Christmas, leading to a nasty virus which nearly had him admitted to hospital for 2 weeks. After a course of strong oral antibiotics he is back on track and is as active and hypo as usual! Joe has been quite poorly for about 6 weeks now with one viral infection after another (colds, coughs, temperature). This has lead to him being put on a strong oral antibiotic for 2 weeks and if that does not shift the Psuedomonas infection he is fighting, he is to go in to hospital for 2 weeks. We are keeping everything crossed that he will not need IV’s as he is terrified of needles – here’s hoping the antibiotic works. Thank you to everyone who sent Joe a Christmas card, he’s loved getting lots of post over the Christmas holidays. Thank you very much to the person who sent Joe letters from various Reindeer over a 2 week period, he really enjoyed reading the letters. We were overwhelmed with the presents sent to Joe this year – about 20 in total. He loved every one of them. Thank you for everyone’s generosity. Thank you for the big box Joe received today for Christmas from a Company based in London through Post Pals. He’s put it under the tree to open on Christmas day – although he’s itching to open it now! Thank you for the package from Post Pals too and the quilt he received last weekend from Love Quilts – he was really pleased about that. Thank you for all the lovely things Post Pals does for Joe – he gets great pleasure out of the post he receives. I just wanted to say thank you very much to whoever sent Joe the jigsaws. He’ll be really pleased with them, especially the Spiderman one! I haven’t opened the large one, I’ve left that for him to do when he gets in from school. Joe continues to keep relatively well although we are aware that inside things are not as good as they should be for a child his age after his Annual Review results last month. He has a significant amount of scarring on his lungs showing deterioration. On Wednesday we are going to EuroDisney for Joe’s Starlight Foundation Wish so he can have breakfast with Mickey Mouse – he can’t wait! He loves Mickey Mouse. Joe hasn’t had much post recently but loves receiving any post addressed to him, no matter how big or small. Joe remains very well. It is his annual review on 3rd June so we will really be able to tell then what is going on inside. Thank you to all who sent Joe a birthday card or present this month. Joe continues to keep well. We would like to thank everyone who has sent Joe a card, a letter or a small gift this month – he is always very excited to receive post and it makes him very happy.